The Diatribe is hosting its first annual fundraiser as a nonprofit organization on April 26th at The Waldron Public House downtown Grand Rapids. The Diatribe Annual Fun'Raiser Party Masquerade Edition which starts at 9pm and will go until 2am will feature DJ AB - Everything AB and Dj Omega Supreme. April 26th at The Waldron Public House 9 p.m. - 2 a.m.
Tickets are $15 and all proceeds will go directly to The Diatribe. You can check out the Facebook event here and purchase tickets here. The Diatribe is throwing a party and everyone is invited. Now, if you're not an educator or familiar with the poetry scene here in Grand Rapids you might be wondering who or what The Diatribe is. The spoken word collective turned nonprofit organization uses performing arts to empower young people to share their stories, raise awareness of social issues, and create change within their communities. Though the nonprofit status is new, the work they're doing is not. Non-traditional teaching artists Fable the Poet, Rachel Gleason, and G Foster II have been inspiring young people through in-school programming for the last five years and are thrilled to take their vision further than they ever imagined. 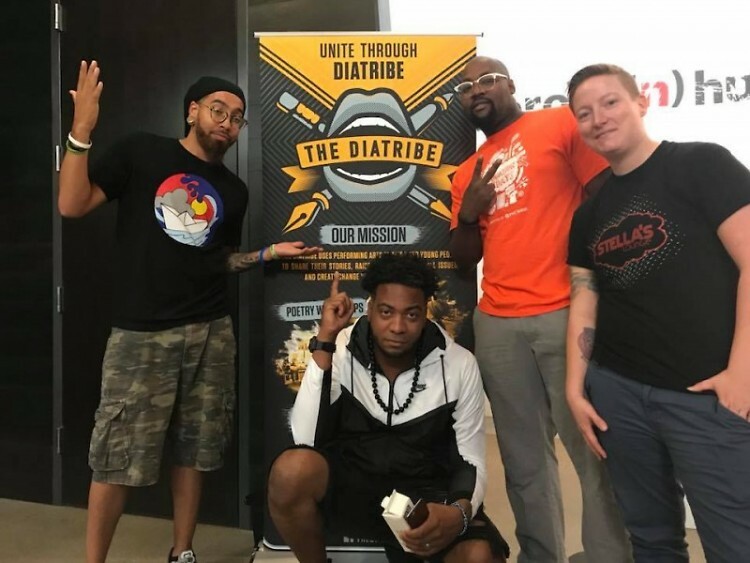 Being non-traditional in many ways, The Diatribe knew they didn't want their first fundraiser to be a gala or a silent auction. Instead, The Diatribe Annual Fun'Raiser Party: Masquerade Edition at The Waldron Public House from 9 p.m. - 2 a.m. on April 26th will be a night of dancing, drinks, and fun. The event is sponsored by Stella's Lounge and The Waldron Public House and will feature DJ AB - Everything AB and Dj Omega Supreme to keep the party going all night long. Guests are encouraged to dress up and wear masks, which will be available for sale the night of the event. The masks serve as a representation of The Diatribe's work to encourage young people to remove the masks they may wear in their day to day lives. The Diatribe looks forward to welcoming you to this fun and engaging event where you can enjoy a cash bar, network, dance, and have a blast while simultaneously raising money for youth poetry programming for aspiring young artists in Grand Rapids.